Park City commits to 100 percent renewable electricity. “Ski seasons are becoming unpredictable," McKenna Peterson said. McKenna Peterson, a professional skier who grew up in an Idaho mountain town, warned of a changing climate that poses grave risks to communities such as Park City that are largely sustained by ski and outdoor tourism. The Climate Reality Project’s “I Am Pro Snow’s 100 percent committed” campaign is taking action to combat climate change’s harmful effects by partnering with local governments and business leaders around the world. Fourteen of the 15 hottest recorded yearly average temperatures have occurred after the year 2000. 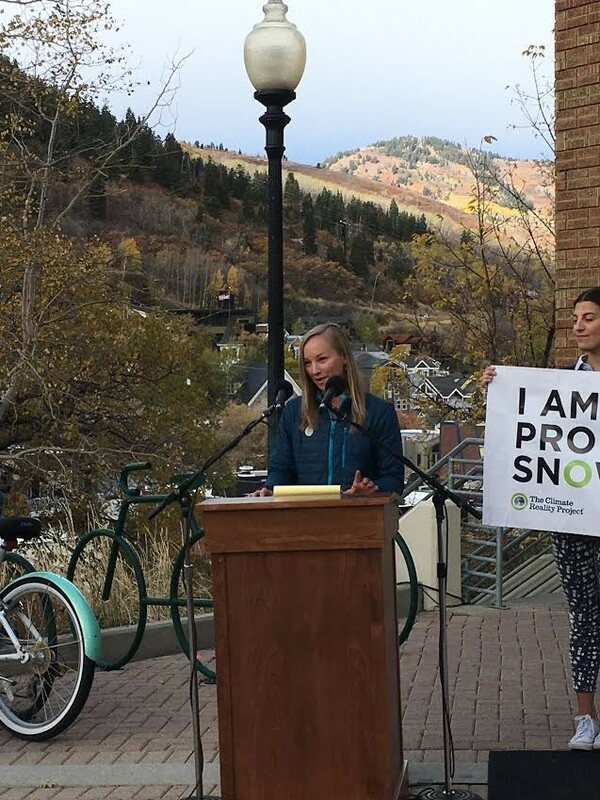 Peterson, now a Utah-based skier, lauded Park City officials Tuesday in front of City Hall for signing on to environmentally conscious commitments. “We hope this announcement will inspire other mountain towns,” she said. Currently, the Boulder, Colorado-based I Am Pro Snow campaign is working with 117 entities worldwide toward committing to using 100 percent sustainable electricity. Program Manager Talya Tavor said Park City is at the forefront of the global fight. “When you combine the passion of the mountains with the powerful force of community, there is not much that can stop us from protecting the things we love most in the world,” she said. Park City has about 1,200 solar panels that help power municipal operations, and officials intend to install more. The water department hired an onsite sustainability manager to find more efficient ways to operate. In the next few months, the city’s transportation team will roll out five electric buses. Park City Mayor Jack Thomas said his city is one that stands on sustainability, civility and propriety. Salt Lake City officials made a similar pact this summer. Taylor Poulson, sustainability programming manager for Salt Lake City, outline the city’s path to combat climate change, which included a cooperative clean energy statement with Rocky Mountain Power. In July, Mayor Jackie Biskupski and the City Council signed a resolution committed to powering the city with 100 percent renewable electricity by 2032 and aiming for an 80 percent reduction in carbon emissions citywide by 2040. Salt Lake, Summit County and Park City are drafting a joint feasibility study to determine how the entities can switch to renewable energy sources. That study should be ready by December or January, Poulson said. Peterson is encouraged that other communities, ski resorts and local businesses will join in the effort. “Happy powder hunting,” she added as she walked away from the lectern.